The McLean family connection for my family history goes back to the middle of the 18th century. The first ancestor for whom we have definite dates is Malcom. He was born 20 June 1760, and was christened 22 June 1760 in Barony, Lanarkshire, Scotland. His parents were Daniel McLean and Elizabeth Bogle, m.1758. Malcom McLean married Grizel, or “Gursey”, Miller, 26 May 1787, aged 27. They were married in Bonhill, Dunbartonshire. Grizel was born presumably in 1766, having been christened 21 August 1766, in Cardross, Dunbartonshire. Her parents were William Miller and Isobel Lindsay, but there are no certain dates for them. Grizel Miller was some 20 years of age when she married Malcom McLean. There is no clear indication as to when Grizel or Malcom died. The dates of birth for their children provide the only certain clues at this time. There were three children. The oldest, Janet was christened 27 September 1787 in Bonhill. No other information is available. Donald was christened 25 November 1793 in Bonhill. No other information is available. Our ancestor Daniel was christened 3 May 1816 in Bonhill. It is the story of the family of emigrant, cordial maker and father of four children, Daniel McLean, that is told in this chapter. Ken Taylor notes that the christenings and presumably births of these three children spans some 23 year and that in 1816 their mother Grizel would have been around 50 years of age. The information on his death certificate indicates that he died 2 June 1880 at the age of 72 – that would make his year of birth 1808 which we can take as more likely than 1816. Daniel McLean married Flora Cameron. In the absence of a marriage certificate, it is difficult to say when they were married; however, from their death certificates, the year could have been somewhere between 1837 and 1839. Flora Cameron was christened 5 March 1816 in Drymen, Stirling. Her younger brother John was christened 13 October 1819 in Luss, Dunbartonshire. Their parents were Donald Cameron, a shepherd, and Lillias Murray. Donald Cameron was christened 24 May 1790 in Buchanan, Stirling. His parents’ names are not certain, but Donald Cameron and Mary McGrigor seem likely. Again, the names of Lillias’ parents cannot be stated with any certainty; possibilities include David Murray and Janet Drummond or George Murray and Lillias Callander. However, Lillias Murray was christened 13 March 1780 in Drymen, Stirling. Donald Cameron and Lillias Murray were married 25 March 1815, in Drymen; he was about 25 years of age and she about 35 years of age. There is no information about their deaths. We can assume that at some time between the births of their two children they moved from Drymen across Loch Lomond to Luss. To return to the newly-weds Daniel McLean married Flora Cameron. They were to have seven children: it is likely that four were born in Scotland and three in Australia. Let us assume the first four children were born in Scotland. Lilian Murray McLean, the eldest girl, thirteen when she arrived in Sydney, was born 26 August 1841 and christened in Bonhill, Dumbarton, in 1842. Between 1842 and 1848 the family must have moved closer to Glascow, Elderslie and Arkleston lying west and east respectively of Paisley, the largest town in the historic county of Renfrewshire and lying west of Glascow. Flora, seven, was born 30 March 1847 in Elderslie, Renfrew, west of Paisley (she was noted as being able to read, though oddly no such note was made for Lilian, who was thirteen). Malcolm, my great-grandfather, was born 30 July 1851, Elderslie, Renfrew, and was three when the family made the voyage to Australia. Daniel, the infant, was born in 14 December 1853 in Arkleston, Renfrew which is somewhat east of Paisley. Today, Arkleston is a railway junction about a mile from Paisley Gilmour Street railway station. It was at this time that the family decided to emigrate to Australia. No reason is known for their decision. It was 21 February 1855 when the McLeans arrived in Sydney on board the ship Anna, with four children. Daniel McLean, thirty eight years old, a farm labourer, and Flora Cameron, aged thirty-two, had been married some 18 years: their eldest girl, Lilian, was thirteen years of age. Daniel, according to the shipping records, could read and write and was in good health. He belonged to the Church of Scotland and his parents Malcolm McLean, a farmer, and Gursey Miller were both dead. Flora, who was also able to read and write – the Scottish education system was highly regarded throughout the world for many years – came from Luss. In the Shipping List there is a lengthy (but unfortunately illegible) comment on her parents, Donald (given as Daniel, on her death certificate by her husband Daniel) Cameron, a shepherd, and Lilian (or Lilias) Murray. I understand that the father was living and the mother dead. Working from the death certificate, we can assume that Flora was born in 1816. There were another three children, a boy and two girls: the boy, John C(ameron) McLean, was born in Sydney in 1859, but the names of the girls and when they were born and died are not known, though they were deceased by 1880. The two girls may have been born and died in Scotland. The family appears to have settled in Sydney, at 501 Bourke Street, Surry Hills, eventually if not immediately, for that is where both Daniel and Flora died. 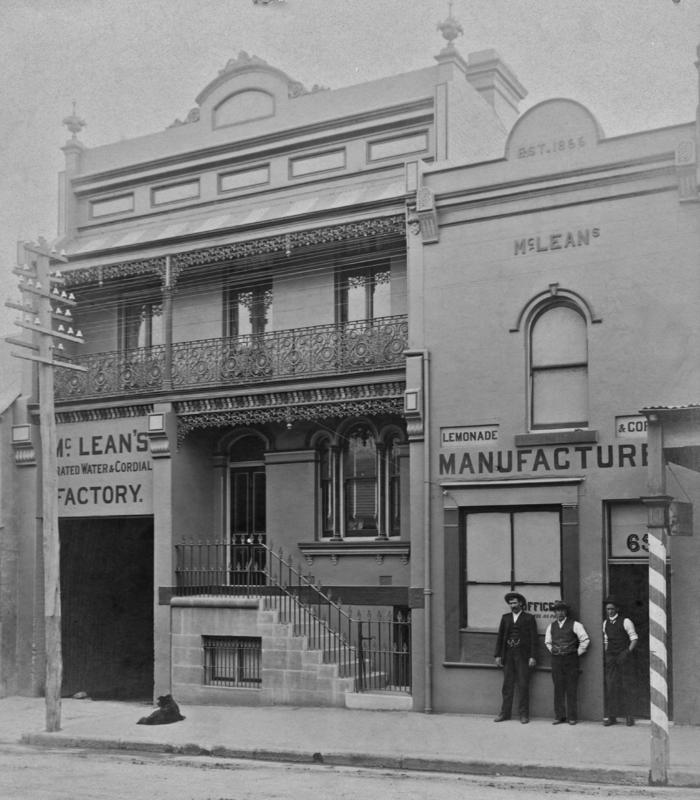 At some time Daniel established a Cordial Factory at 65 Fitzroy Street, Surry Hills, a building which still stands. The complex consisted of a three story dwelling for the family, a factory with a semi-circular gable proclaiming “Est. 1866” and a stable. A sign over the stable entrance reads “McLean’s Aerated Water & Cordial Factory. Lemonade and Cordials Manufactured”. What of their seven children? Until recently, of Lilian and Flora, the two eldest children, I knew nothing. Ken Taylor has discovered a good deal of information, which I add here in brief. 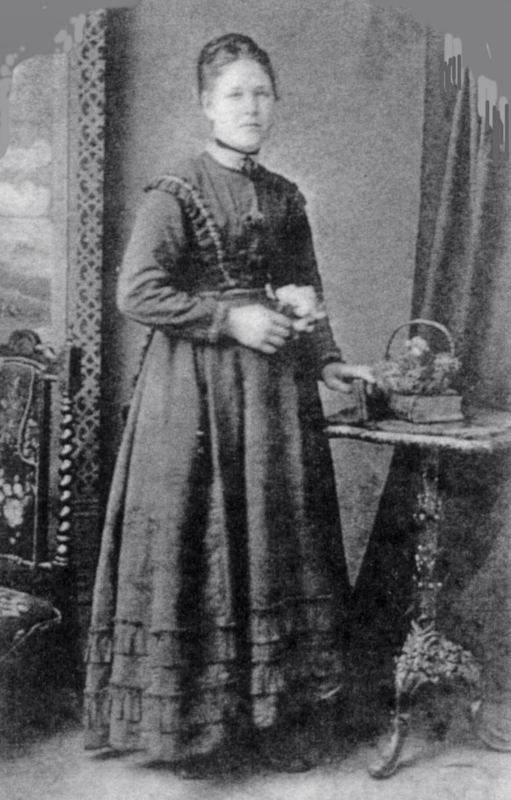 Lillias, Lilian or Lilly, the eldest McLean girl, married George Bye, 20 years of age, in 1860. There was no issue. There is an odd note in the Sydney Morning Herald which says: “I the undersigned will not be responsible for any debts contracted by my wife Lillias, from this date. Signed George Bye.” Lilian died in Wallsend NSW in 1889. What story lies within these sparse and enigmatic details? Flora McLean, the second McLean child, married William Spain in 1860. He was 34 years of age. He died in 1908 or 1909. They had three children: Mary Ann Spain, born 1875, married John Ashworth 1909, buried 2 September 1924; Flora Cameron Spain, born 1878, buried 14 March 1916; and Lilly Bye Spain, born 1880, died 1881. Flora died aged 34, and was buried 7 June 1881 at Rookwood Necropolis. Malcolm McLean’s story follows presently. 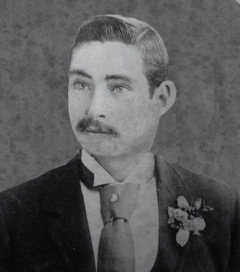 His younger brother Daniel married Janet (Jessie) Wallace and died in 1904 aged 50. Youngest brother John C(ameron?) died in Sydney in 1890, aged 31 The fate of the two youngest girls is not known except that they were deceased by the time of their parents’ deaths (mother in 1877 and father in 1880). Let us now turn to Malcolm, my great grandfather. Malcolm McLean married Julia Dedicoat, 29 April 1874. On the wedding certificate her name is given as Derecourt. Her story is given the prominence it deserves in the chapter entitled The Day Girls. Witnesses were Isabella Bell and Daniel McLean, and the ceremony took place according to the rites of the Presbyterian Church at the home of the Reverend Doctor James Fullerton, Elizabeth Street, Sydney, as was the custom of the time. Malcolm’s occupation was given as Cordial Manufacturer, which had been his father’s occupation before him. In the later years of his marriage Malcolm McLean and his wife Julia moved to The Mall, a charming cottage at 38 Maroubra Road, South Randwick (now Pagewood, and a less than charming block of flats presently stands on the site). At that time, Malcolm’s cordial factory was in Botany. Olga Nisbett recalled visiting the factory but she said she did not remember her grandparents very well even though her family lived only a few doors away at Balgowlah, 54 Maroubra Road (now a car sales yard). A family friend, Thelma Lavender, wrote “I knew all of the Butler family including Marny and Jule’s father, and our friendship went back to about 1911. I also knew Gran and Grandpa McLean as well as Olga’s family”. Malcolm died at The Mall, 20 September 1920 and was buried by Kinsela’s in the Presbyterian cemetery at Waverley, with Presbyterian minister Rev. D. Finlayson in attendance. There were five children. Lily, Daniel, Julia, Blanche and Malcolm. Lilly (or Lily), as her name is given on most certificates relevant to her, was my father’s mother, a dignified woman I only know from photographs, as she died in 1910, was born 30 December 1874 at 558 Bourke Street, Surry Hills. On her son Malcolm George’s wedding certificate her name is given as Lillian Blanche. Her story is told in more detail in the chapter on Edward William Butler and Lilly McLean. Daniel was born in Sydney 15 October 1876, the second child of Malcolm and Julia McLean. Like his father, he was Presbyterian. His mother, Julia, was christened as a Catholic – her mother’s religion – but the circumstances of her life did not draw her to that religion, as her story will make clear. He barely knew his grandparents, Daniel McLean and Flora Cameron, who died before he was five years of age. He probably attended the Albion Street School between 1882 and 1890. Though his younger brother Malcolm died at the age of 11 when Daniel was 17, the girls of the family were apparently healthy, though his older sister Lily died aged 36 from puerperal septicaemia, after childbirth. Daniel was almost certainly involved in an accident around the age of 22 or 23 (1898-9), injuring his back and head. What followed that accident is not clear but he was admitted to Callan Park Hospital Asylum in September 1907 and May 1908. He died in there 18 September 1908, aged a mere a month short of his 32nd birthday. Sarah Charlton, Daniel’s wife, was born in Brooklyn USA, 11 November 1874. She and Daniel were married 16 October 1902. There was one child stillborn in about 1903. Lily Cameron McLean was born 6 December 1905. Sarah Charlton remarried in 1910; her new husband was Edwin Sydney Fleck. Lily Cameron McLean was born 6 December 1905 at 65 Fitzroy street Surry hills – the Cordial Factory. She married John Taylor, 16 February 1929. There were three children: Kenneth Owen Taylor born 26 September 1931, Warren Thomas Taylor born 3 February 1939, and a daughter Carol Marie. Lily Taylor died 31 October 1990, aged 84. Julia, the third child, born 15 August 1878 married Herbert Donald 23 November 1924. There were three children: Malcolm, Herbert and Olga. There are many descendants. I believe I met Aunt Julia and Aunt Blanche in about 1955 at a sixtieth birthday party for their niece Julia’s husband, Charles Blake. In the mid-seventies later I saw Blanche in a nursing home at Bankstown just before she died. I regret not appreciating more their relationship to me. Let me return to my grandmother, Lily McLean, who married Edward William Butler. Though their story is told more fully in a later chapter, I wish to tell something of the story of her only daughter, my aunt Julia, my father’s older sister. As my aunt told the story, when her mother died in 1910 and her father remarried 27 September 1911, she moved away from her immediate family and went to live with her McLean grandparents. Her stepmother, Mary Elizabeth Gavin, Edward William Butler’s third wife, was the woman I knew and loved as grandmother, but Jule did not feel easy with her in those early years of the remarriage so she moved to her grandparents’ home. I was never conscious of any ill feeling between the two women when I knew them in the 1940s and 1950s. While I am not certain of the chronology of events, it is certain that the McLeans moved to a new home at The Mall 38 Maroubra Road, Maroubra, and photographs from the time indicate that Jule was with them. Malcolm had moved his Cordial Factory to Botany some time earlier and the family moved to Maroubra Road to be closer to the factory. or rattle off “It’s a braw bricht moonlicht nicht”, a propos of nothing. After many years I have just discovered that the Selkirk Grace has been attributed to Rabbie Burns (March 2018). 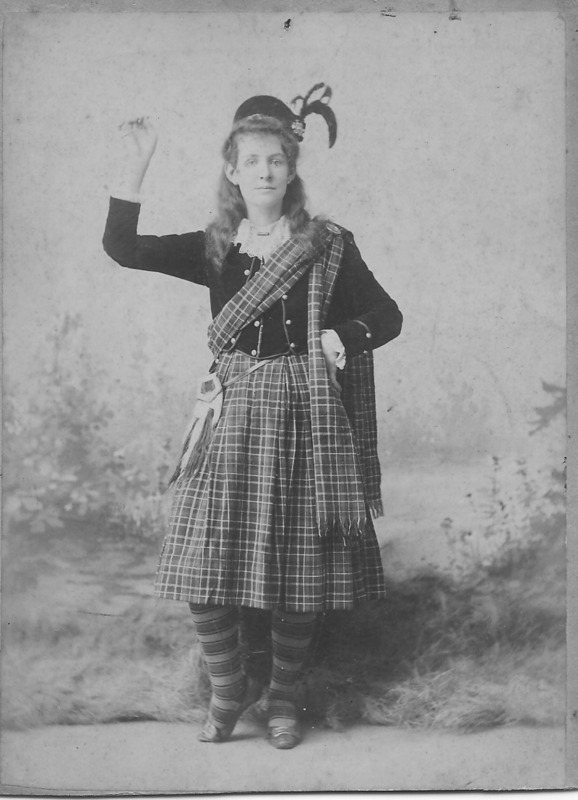 Her mother, Lily, a McLean, must have retained something of her Scottish heritage: there is a lovely photo of her in full Scottish rig. We are lucky to have several photos from this time showing various members of the family. 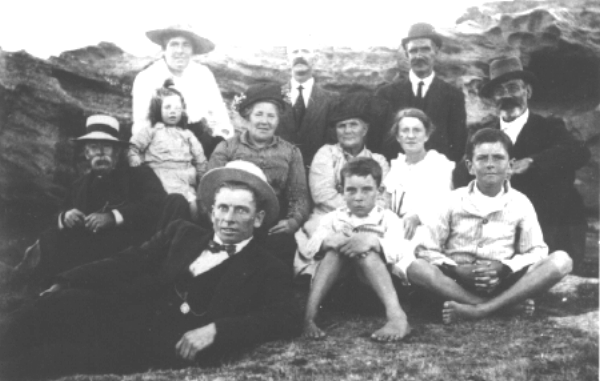 Perhaps the best of them is of a family picnic group taken at La Perouse, September 1900. I am fortunate to have it because my aunt Julia almost did not give it to me in the 1970s when I first began collecting family stories. She had told me I could have it after she died but gave it to me as I was leaving. Why fortunate? After she died, I did not receive any photos or papers. 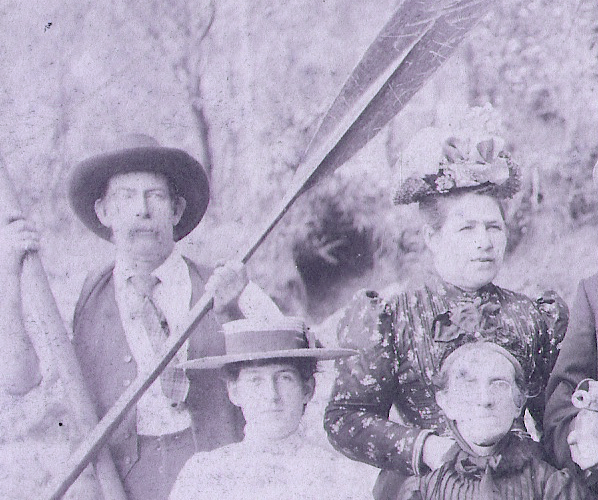 This delightful picture, complete with two sets of crossed oars, a watermelon and bunches of eucalypt, features Malcolm McLean and his wife Julia Dedicoat, our great grandparents, his brother Donald McLean and his wife Jessie (front row, 3rd and 4th from left), and Malcolm’s three daughters – Lily (our grandmother), Blanche and Julia. Blanche is accompanied by her husband, John Hickey. Lily is accompanied by her husband Edward Butler, and they are holding two of their children, Julia (my aunt) and Edward, always known as Ted. 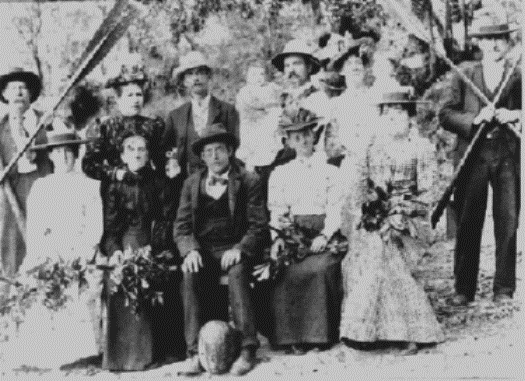 Edward Butler’s brother, Percy Cedric, and their mother, Eliza Butler, are also in the photograph, he with the pith helmet, she in the front row, second from the left. It is a veritable treasure. Back to Malcolm McLean. From Elderslie to Waverley, Presbyterian to the last: 10,000 miles and two years short of his allotted span of seventy years. He retained his Scottish accent, perhaps his closest tie with the “auld countrie.” I wonder whether he knew that his father-in-law was a convict from the Sassenach south, a Brummie boy, and a dinkum Aussie bushranger to boot. One wonders what Malcolm McLean, Presbyterian and cordial manufacturer, knew of his wife’s personal story. Probably a great deal, but we will never know. It is a marvel that we have been able to piece together so much of her story and tell it many years after her death. Malcolm McLean died 12 March 1920 and was buried in the Presbyterian section of the Waverly Cemetery. His wife, Julia McLean, died 8 August, 1941. Her story is now told in far more detail than my aunt Julia ever knew, but it was from the few scraps that she shared with me that I have been able to tell the sad story of her grandmother’s life. The scraps: that Julia McLean’s mother, Mary Day, turned up on her doorstep one day – where or when, I do not know – and said “I am your mother”. Julia was understandably perplexed and sceptical. “How do I know that?” The older woman produced a Catholic prayer book and recited a few lines of a Catholic prayer. Julia, purportedly, told her: “Even if you are my mother, I don’t want anything to do with you because you abandoned us when we were children”. She turned her back on her mother, never to see her again, and thus Mary Day disappears from the scene. I am not even certain where or when she died, though the search goes on. Jule also talked about her grandmother kneeling to say her Catholic prayers, including the Hail Mary, of an evening. This seemed odd in a Presbyterian household. However, Julia had been christened as a Catholic and had spent several years in a Catholic Orphanage at Parramatta where the Sisters taught her prayers. 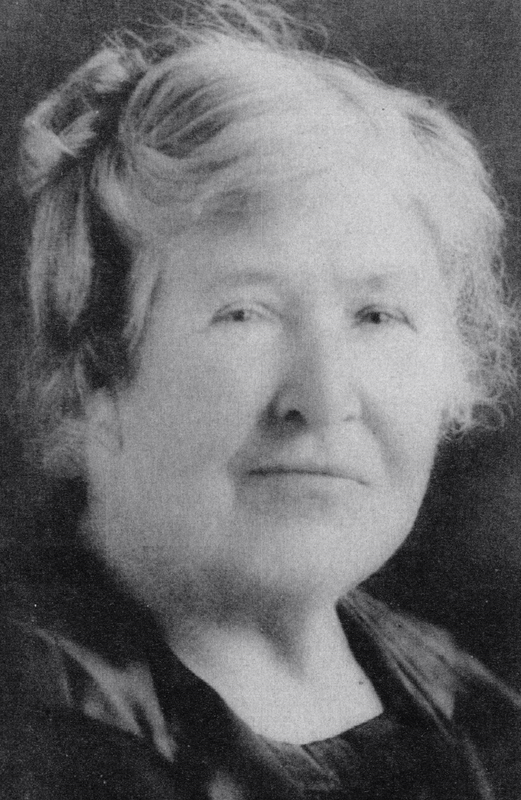 Julia McLean (pictured here in older age) died at the age of 86, 8 August 1941. She was buried in the Church of England Cemetery, Waverley. I like to think that I may have met her in the first eighteen months of my life, but that is highly unlikely. I believe she was blind when she died of hemiplegia, that is, a stroke, in “Helenie”, a private hospital in Randwick. She was eighty-six years of age and had seen a varied life from the Sofala gold diggings to the Orphanage at Parramatta under the care of the Good Samaritan Sisters, Magdalen, Gertrude and Agnes. It was in the Orphanage that her younger sister Elizabeth (Eliza, Betsy) died at the age of five. Julia probably left the Orphanage to go into service in the Surry Hills area where she undoubtedly met Malcolm. Julia lived in the Fitzroy Street Cordial Factory with, by all accounts, a loving husband and six children, and later moved to Maroubra Bay Road and thence to “Helenie”, where she died. She kept her counsel about her unusual father, William Dedicoat, and seems not to have spoken of her mother, except to tell a story which today seems sadly unnecessary and tragic. Even in her marriage she faced great grief, with the early deaths of her two sons Malcolm (aged 11) and Daniel (aged 32) and her eldest daughter Lily, my grandmother (aged 36). How much grief can the human spirit bear? My role in the day was to assist Her Excellency Governor Marie Bashir in planting a commemorative tree and to speak about my great grandmother Julia and her three sisters who were inmates of the Roman Catholic Orphan School which occupied the site from 1844 till 1886. These girls, Mary Anne, aged 6, Matilda 5, Julia 4 and Eliza (Betsy) 2, were sent to the Orphanage at the end of 1859. I have no idea when they left, though the youngest girl Eliza died there in 1852. Her name is recorded on a Memorial Quilt along with the names of the other 128 children who died in the Orphanage. There are no records of the establishment, but I was fortunate to receive a document from the St Mary’s Cathedral Archives which gave me enough information to shape their story. I have been able to put together a rather substantial account of their lives, though there are great gaps in my knowledge. While the official proceedings were going on, during the Governor’s talk and during mine, a butterfly continued to hover in and about and around the official party. So obvious to all present was this delicate creature’s movement that murmurs went around – “It’s a sign. There is peace; there is reconciliation.” I like to think that the souls of Mary Day, Julia McLean and her sisters Mary Ann, Matilda and Eliza, have found peace at last. Their stories are told in their own chapter. The story of their parents, William Dedicoat (Jones and Day) and Mary Kirwin, is told in their chapter. 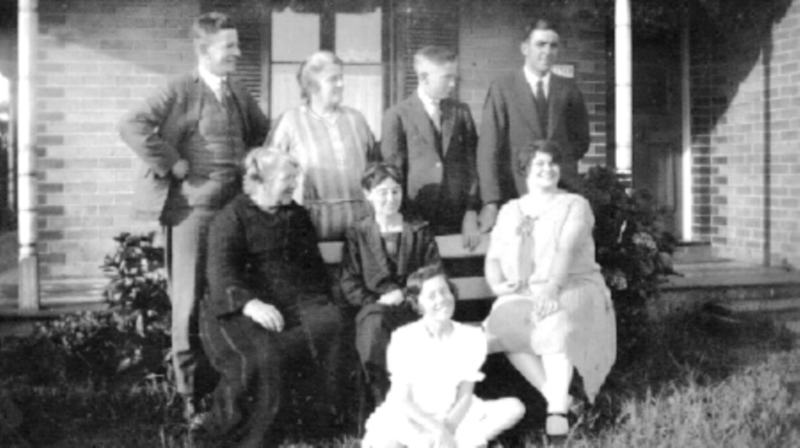 Front Row: Son-in-law of John and Mary Seech; Herbert and Malcolm Donald (brothers of Olga). Middle: Julia McLean, Bree Gavin, ? Edward and Malcolm Butler were two of Lilian McLean (Butler)’s children. (Their sister was Julia, who lived with her grandparents.) The Gavins were relatives of Mary Elizabeth Gavin whom Edward William Butler married, September 1911, after his wife Lily died. The information concerning the names and dates for this section of the chapter comes from Ken Taylor who did much research on the earliest McLeans and their marriages. Ken and I are second cousins – our grandparents, Daniel and Lily Mclean, were siblings. My aunt, Julia Butler, who had a very close association with the McLean family through her grandfather Malcolm McLean, used to say that the name should be spelt “Malcom” – and so it is for this man, Julia’s great great grandfather, though not for later McLeans, including her grandfather. Today, what was Barony has been swallowed up by the city of Glascow. In the past it represented lands to the north of the city which included Maryhill, Lambhill, Bishopbriggs, Kelvinside and a number of other areas. This information as well as the map of Glascow boundaries is available on the internet. A note on the name “Grizel” (spelt “Grizal” on son Donald’s birth certificate). The name is a Scottish variation of Griselda, a Teutonic name meaning “grey battle”; its diminutive is “Gursey”. Note: Dumbarton, but Dunbartonshire. Today Bonhill forms a conurbation with Dumbarton, Alexandria and Renton, which lie on the east bank of the River Levin which flows into the Clyde Estuary to the west of Glascow. Cardross is a large village with a population of 1,925 (2001)in Scotland, on the north side of the Firth of Clyde, situated halfway between Dumbarton and Helensburgh. Cardross is in the historic geographical county of Dunbartonshire but under the modern political local authority of Argyll and Bute. He may have been born as early as 1808 – Ken Taylor and his brother Warren, who have done much research on the McLean family, suggest they may have lowered their ages to get assistance for their journey to Australia. Even then his mother Griselda would have been 42. Drymen is a village in Stirling district in central Scotland. It lies to the west of the Campsie Fells and has views to Dumgoyne on the east and to Loch Lomond on the west. The whole area is part of the Loch Lomond and the Trossachs National Park . The population, as of the 2011 census, was 820 people. Despite the growth in the numbers of villagers commuting to Glasgow to work, there remains an agricultural tradition in the area. The Scottish family name Drummond is derived from an old form of the village name. Luss lies on the other side of Loch Lommond somewhat to the north-west of Drymen. There is a variety of spellings of Lillias including Lilias and Lillas; Lillian and variations are diminutives of Elizabeth. Lily, however, is a different name. Daniel and Flora’s granddaughter (my grandmother) was christened Lillian Blanche McLean but generally referred to as Lily. I visited Luss in 1987 and found it a delightful little picture postcard village by the Loch. On the Shipping List, NSW State Archives, Reel 2486, her name looks like Grizell, but Gursey appears on Daniel McLean’s death certificate. See footnote note 4 above. From a 1900 photograph of several staff and family standing out front. Ken Taylor notes that there is no Chester Street in Surry Hills. The nearest Chester Street is in Woollahra and there is a Chester Lane in Zetland (Navin Lane in 1949). The details given by Ken Taylor give the two years. The photo features, at the back, Malcolm McLean and his wife Julia Dedicoat. It is part of a photograph taken La Perouse, September 1900. One of their daughters, Blanche, is front left. The other woman is Eliza (Helyar) Butler. I spoke to the Librarian of the Sydney Presbyterian Church, 29 October, 1985 and she responded without hesitation with this information. She was familiar with Fullerton and the “custom of the time”. Olga Nisbett, neé Olga Donald, daughter of Julia McLean and Herbert Donald. Mary Elizabeth Butler, who married Edward William Butler after his wife Lily McLean died in 1910. Lily McLean was E.W. Butler’s second wife – the story is told in the chapter on E.W. Butler. Mary Elizabeth, generally referred to as Mana when I was a youngster, thus became stepmother to E.W. Butler’s children. His daughter Julia, not getting on with Mary Elizabeth, went to live with her grandparents, her mother’s parents, Malcolm and Julia McLean. Mrs Thelma Lavender, Milton, NSW, 21 September 1985. Note – not in Fitzroy Street. Details of the Callan Park Records are found among the State Records, Kingswood. Ken Taylor – Daniel’s grandson – has researched Daniel’s condition thoroughly. The details of his “disturbing the peace” are unknown. Callan Park Records, State Records, Kingswood. My guess is that the phrase is morbus cordis, ie, heart disease. There is a photograph including several of the Donalds at the end of the chapter. See accompanying photograph. Julia McLean is on the right of the group. The others are unknown. At this time Jule had moved from Judd Street Banksia into a unit in Carlton Parade, Allawah where she was to live until she died at the beginning of 1982. This tragic story is told in fuller detail in the chapter on the Day Girls. The formal explanation of the day. Grizel is my 4 great grand aunt.